Situated at the confluence of the Sea of Cortez and the Pacific Ocean, this spectacular resort is surrounded by natural beauty and sets the stage for an idyllic family vacation or romantic getaway. Luxuriously appointed guest rooms and suites feature high-tech amenities, sleek bathrooms and balconies with spectacular beach and resort views. Dine at three specialty restaurants, enjoy a world-class spa and fitness center, or tee off at the Puerto Los Cabos Golf Club. 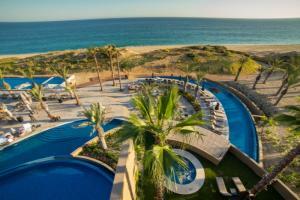 Located on the upscale Puerto Los Cabos Development, just steps away from the beach.